It’s time again for Acumatica 2018 R2 Launch Event Series. Attendees will experience firsthand the numerous usability enhancements to our latest release, Acumatica 2018 R2, with each update geared to improving the efficiency of your daily business management processes. Here at Acumatica, September isn’t the month that proclaims the demise of summer. Instead, it’s the exciting time of year when we get to introduce our customers, partners, and analyst communities to the pragmatic enhancements we’ve made to our true cloud ERP solution. Our latest release is set to be unveiled during our Acumatica 2018 R2 Launch Event Series, with the initial day happening on Wednesday, September 12, 2018 in Boston, Massachusetts, and registration is live as we speak. For those who can’t make our Boston event, a localized Launch Event Series will be taking place in a city near you – register today and reserve your spot. Have you ever been to a product-release event that fit everything you needed to know into a half-day timeframe? If you haven’t, then we think you’ll be impressed with our Acumatica 2018 R2 Launch Event Series. Your time is both valuable and limited, so we’ve ensured that the hours between 11 AM and 4:15 PM (local time) speak directly to the improvements in Acumatica 2018 R2. 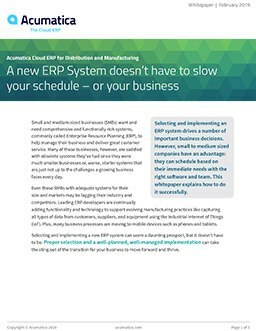 With Acumatica 2018 R2, you’ll see that we’ve made a number of smaller improvements that add up to a large increase in usability for our customers who use Acumatica cloud ERP every day. Usability and user satisfaction play a key role in our development philosophy. In fact, user feedback—which you can provide either online or in person with our Acumatica team members—directs our course of action every year as we work on each release. We’ve been gratified to be the recipient of several awards this year related to customer satisfaction and usability, including a 2018 CODiE award for Best Cloud ERP Solution and topping the new G2 Crowd Report for User Satisfaction. In addition, we were named a “Visionary” among Cloud Financial Vendors by Gartner in their latest market overview and vendor assessment report, which you can download for free now. Listen, we believe registering for this event—and being the first to hear our improvement announcements—is a great idea for a few reasons. One, you can start planning for our latest release in advance. You won’t waste time trying to figure out how to perform tasks that Acumatica 2018 R2 may already address. Two, the event is only a half day. Four hours of learning, networking, and demonstrations (with lunch) all geared towards accelerating the success of your business through usability improvements is definitely worth it. And, three, you’ll have the opportunity to meet with members of the Acumatica leadership team to give your feedback regarding areas of improvement from your specific experience. New report explains how Acumatica R2 focuses on meeting the real business needs of midsized companies. Finally, Acumatica Summit 2019 is coming January 27-February 1, 2019. Our well-attended annual event is the perfect time and place for extended Acumatica 2018 R2 education. It will be here before you know it, and you’ll want to make sure you register to reserve your spot. Our annual Summit and Acumatica 2018 R2 Launch Event Series are all meant to give you, our users, the information and educational insights you need to fully utilize Acumatica cloud ERP. We invite you to take advantage of these opportunities—along with contacting our team with any questions—to give your business what it needs to succeed. Bob Clancy is Acumatica's Senior Events Manager. Bob is responsible for event strategy, registration, and making all Acumatica events an amazing experience for our customers, partners, and broader community.